During the time of the Ayleids, the city-state of Abagarlas worshipped Molag Bal and was gifted with a great weapon, the Mortuum Vivicus. However, the city of Delodiil preemptively attacked, and Bal was forced to withdraw the Mortuum to the Halls of Submission in Coldharbour. Circa 1E 2260, a portal to Coldharbour was opened when the All Flags Navy collapsed the Coral Tower of Thras. Several ships were pulled into the realm, and the Maelstrom of Bal remained as a link between Coldharbour and Mundus. Sotha Sil journeyed to Coldharbour in 1E 2920 to bargain with Molag Bal. The mage Morian Zenas famously visited the realm during his voyages through Oblivion, and wept at the sight of the desolation. The most significant interaction between Nirn and Coldharbour was Molag Bal's attempted Planemeld in the mid-Second Era. In 2E 579, as the Interregnum dragged on and the Dragonfires remained unlit, Molag Bal's minion Mannimarco deceived Emperor Varen Aquilarios into using the Amulet of Kings to initiate a ritual that triggered the Soulburst. The ancient covenant between mortals and Akatosh was broken, and Nirn was set adrift in the Mundus, rendering it vulnerable to Daedric incursions. Molag Bal began deploying machines known as Dark Anchors to pull Nirn into Coldharbour, and sought to merge the two realms into one. In 2E 582, Aquilarios was freed from his imprisonment in Coldharbour and returned to Tamriel in an attempt to fulfil a prophecy of the Elder Scrolls, which had revealed to him that a Soul Shriven hero named the Soulless One would stop Molag Bal's plans. With Varen's help, the Soulless One reassembled the Five Companions (sans Mannimarco) in secret, recovering the Amulet of Kings and exposing Mannimarco's plot to mantle Molag Bal's godhead. Vanus Galerion, concerned by Molag Bal's growing influence on Tamriel, called for a council between the three leaders of the Alliance War to discuss a possible invasion of Coldharbour. Although the alliances were unwilling to provide aid, the leaders gave their blessing for the neutral Fighters Guild and Mages Guild to mount an invasion force. The Tamrielic invaders were initially thwarted by Coldharbour's defenses, being scattered all across the realm after entering a portal. The Daedric Prince Meridia, an ancient enemy of Bal, opened the doors of her stronghold in the realm—the Hollow City—as a safe haven for the scattered invaders. After destroying the Great Shackle and assembling allies from all across Coldharbour, the Army of Meridia made a final assault on the Endless Stairs, where they successfully collapsed the Planar Vortex between Mundus and Coldharbour, foiling the Planemeld. Following his defeat, Molag Bal retreated to Heart's Grief, when Aquilarios chose that moment to strike. Using the Amulet of Kings, the Soulless One was blessed with the power of the Eight Divines, with which Bal was banished to the Void in his own realm. Following this, the Prince lost possession of all mortal souls he had captured. The same year as the Tamrielic invasion, the Fighters Guild was manipulated by Meridia to thwart Bal's plans to return the Mortuum Vivicus to Tamriel, and it was ultimately destroyed. Also that year, Abagandra—the Lightless Remnant of the Doomcrag—was given to Bal and transported to Coldharbour to prevent it devastating the Tamrielic region of Rivenspire. Coldharbour supposedly emulates an apocalyptic version of Nirn, including a defiled copy of the White-Gold Tower. It is unnaturally cold, even with magical resistance, and ancient, blackened ruins fill the landscape. The ground is sometimes described as a barely-traversable sludge. Even the air assaults the senses, changing rapidly from rancid death to sweet flowered perfume. The landscape itself is made up of craggy, floating islands of blackened rock, hovering in the void. Notably, the realm has an abundance of Azure Plasm, a type of chaotic creatia that resembles lakes of icy cold water. The plane is divided into three main regions: the Shrouded Plain, the Black Garrison, and the Fist of Stone. 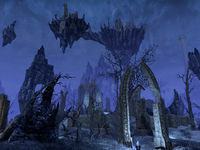 Other important features include the Chasm, a gap between islands that surrounds the Fist of Stone, and the Hollow City of Meridia, which remains outside Bal's influence. Although unsuccessful, the Planemeld had a significant impact on Coldharbour. 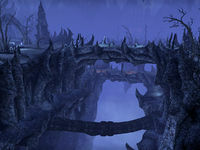 Molag Bal struck a deal with the Mad Architect to construct the Endless Stair and the Planar Vortex, as well as a labyrinthine structure known as the Vaults of Madness. The Great Shackle was built as a mooring for the Dark Anchors, and the Wailing Prison was established to hold the vast number of Soul Shriven being sacrificed to Bal. The Castle of the Worm served as the headquarters of the Worm Cult for a time. 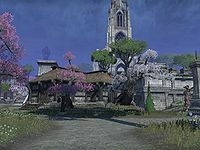 Some parts of Tamriel were successfully ripped into Oblivion, forming pocket realms such as the Village of the Lost that were intended to be integrated into Coldharbour proper. The realm is home to a multitude of Daedra. Included among them are the Cold-Flame Atronachs from the Fourth Sinus of Takubar, the gargantuan Daedric Titans, the Harvesters, and the pesky Banekin. The realm has two major clans of Dremora, the Deathbringer Clan and the Foolkillers Clan, who vie for dominance. As well as the Daedra, many of the realm's inhabitants come from Mundus. The majority of the mortals are Soul Shriven, whose souls belong to Molag Bal and whose bodies are animated with a Daedric vestige in their stead. They live a life of eternal torment, cursed to slowly wither away without their soul only to be reborn. They are used for labor or amusement and eventually lose all sense of self. Some of the Shriven become consumed with hunger and turn feral, eating everything they come across—including lesser Daedra and each other. Other mortals live in isolated settlements for various different reasons, such as the Shadow Walkers of the Moonless Walk and the Argonians of Haj Uxith. Some species of flora and fauna even seem to thrive in the realm, including netch, bantam guar, scuttlers, and various types of fish. The Worm Cult's headquarters in Coldharbour. The headquarters of the Planemeld. A city of Meridia in the center of Coldharbour. A laboratory that emulates a Dwemer ruin. A female Vampire Lord of pure blood, who has been gifted vampirism directly by Molag Bal, is known as a Daughter of Coldharbour. In a speech to the Champion of Cyrodiil, Mankar Camoran incorrectly named Meridia's realm Coldharbour. This page was last modified on 27 February 2019, at 14:48.